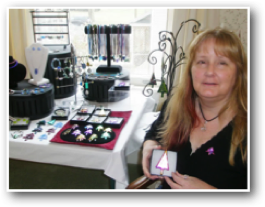 Enjoy some food, fun and fellowship as you create your own dichroic glass pendent using various colors and forms of glass, including gorgeous dichroic glass during this 3-hour workshop retreat. You will explore basic glass fusing techniques and learn some of the history and advanced methods of this unique art form. Fancy silver or gold-colored “bail” hanging elements are attached to make your pendents ready to wear. • Enjoy a relaxing retreat experience with friends. • Explore various glass fusing techniques, processes and tools. • Workshops are great couples, friends, and any small group. 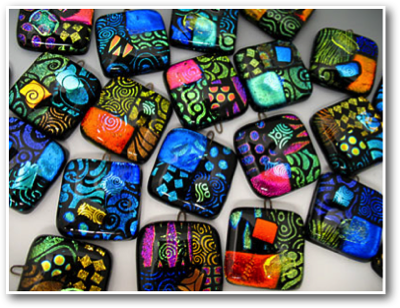 • Currently, glass fusing workshops are offered Sunday afternoons--3:00-6:00.